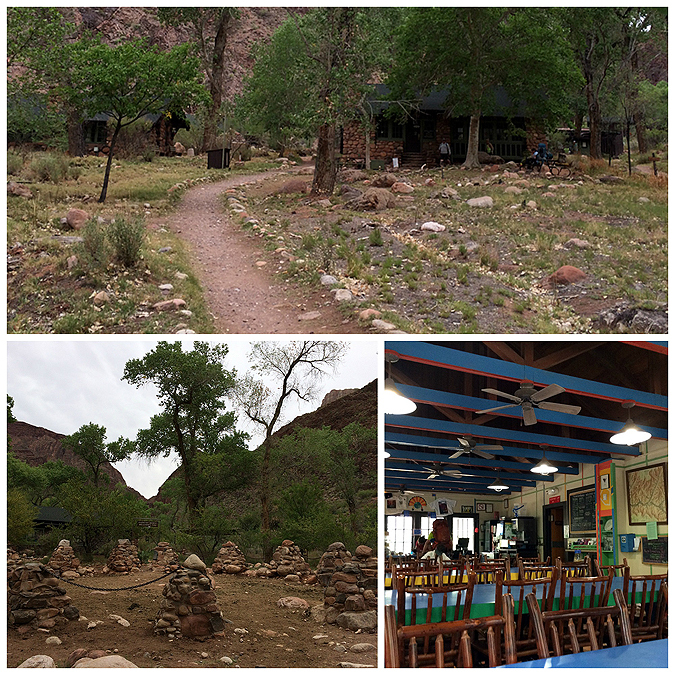 - On Wednesday I drove down to Phoenix to pick up Whitney from the airport before heading back north to stay in the small town of Tusayan, located just outside of the entrance to the Grand Canyon. 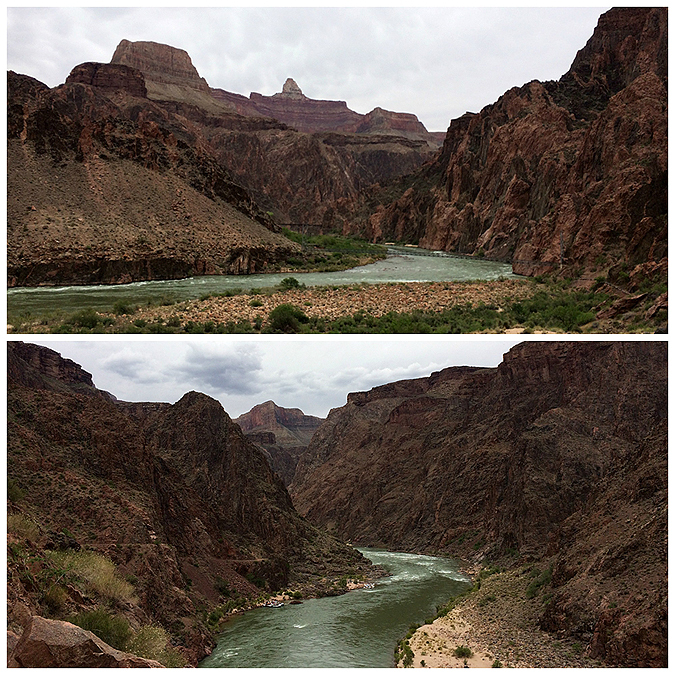 After a nice relaxing night we got up early and headed into the canyon to do one of my favorite hikes a 'Rim to River and Back'. 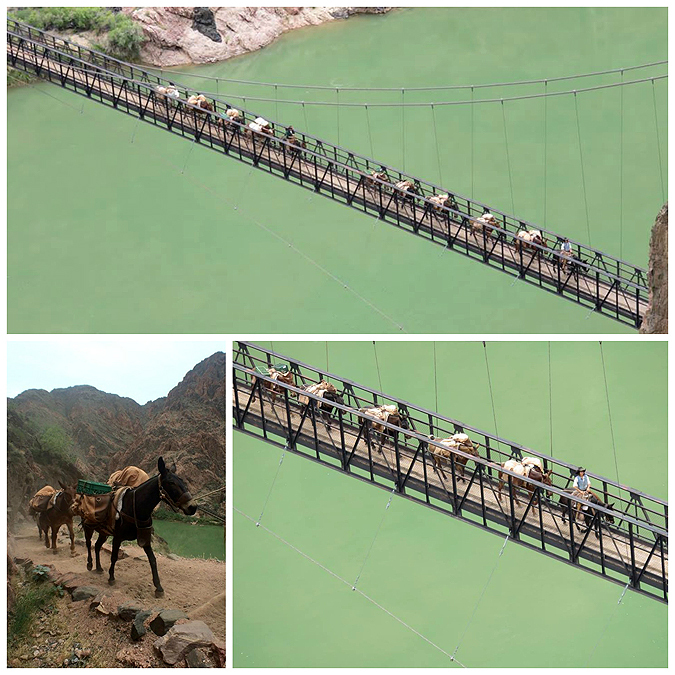 It can be a grueling hike because of the extreme heat over dry and dusty trails with no shade in sight for miles. 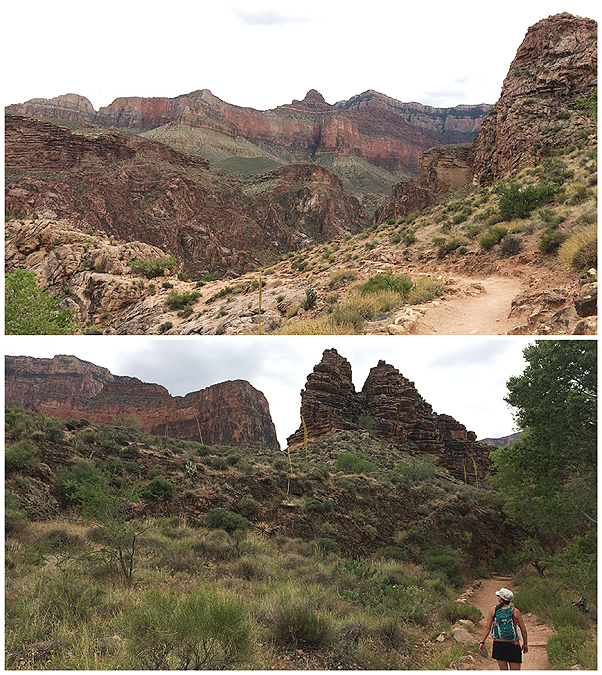 Thursday, however was absolutely perfect, temperatures never reached 80 and the sky was covered in clouds which made for a very easy and enjoyable hike down into the canyon and back out of it. 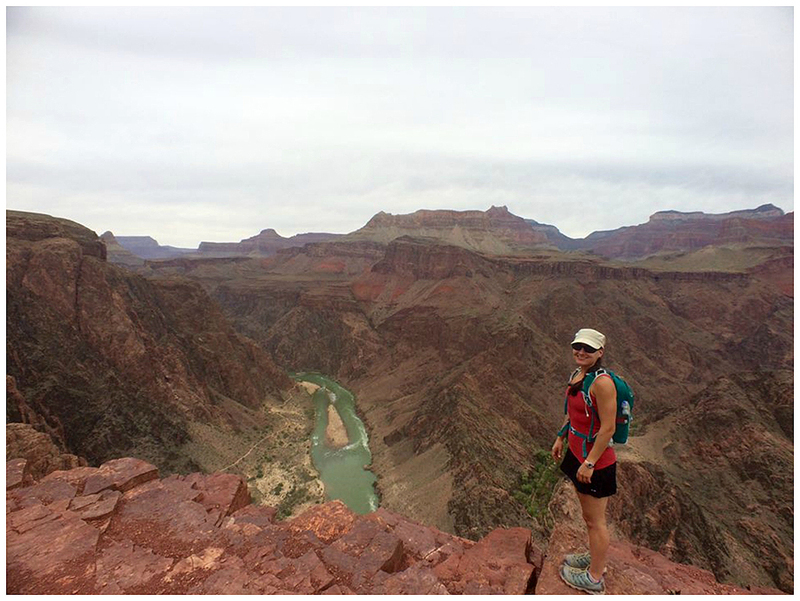 - We started off down the South Kaibab Trail which is one of my favorite trails in the canyon because after its initial descent down from the upper canyon cliffs it follows an open ridge line with super huge panoramic views, whereas most canyon trails stay within the canyon walls down to the Tonto Platform and then to the Colorado River. 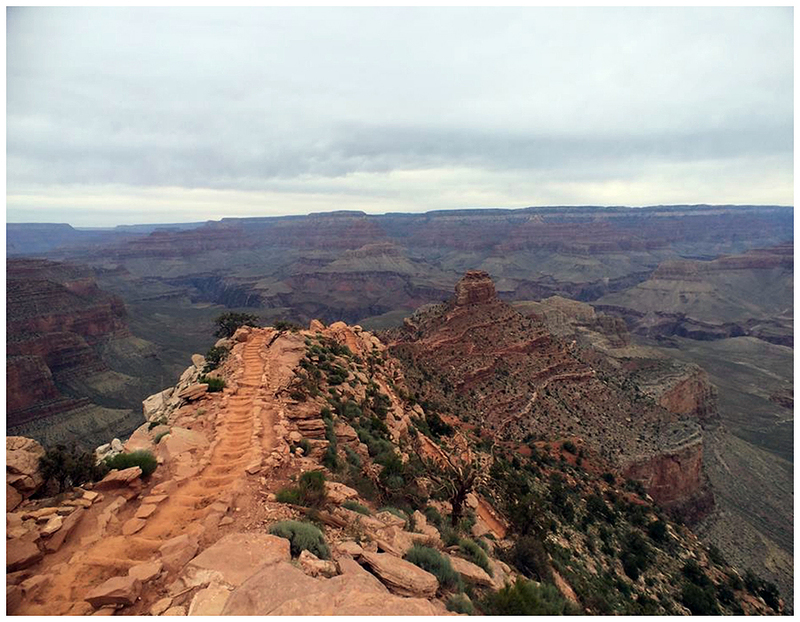 - After a half mile of descending steep switchbacks the trail breaks out into the open at Ohh Ahh Point where there is a great view of Cedar Ridge and O'Neill Butte. The only downside to Ohh Ahh Point on this morning were the chubby mischievous squirrels that at any moment looked like they were about to attack us and steal our food. 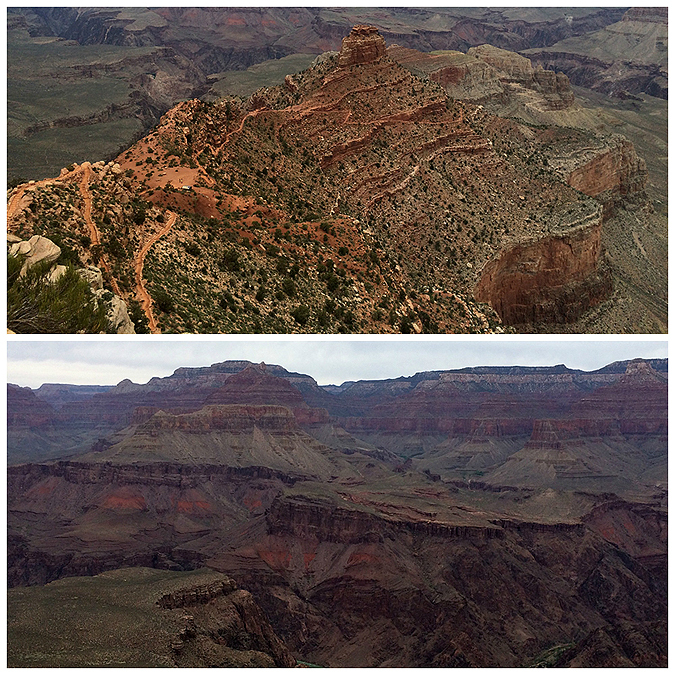 - From Ohh Ahh Point the views really start to open up as the trail descended down to Cedar Ridge and O'Neill Butte. 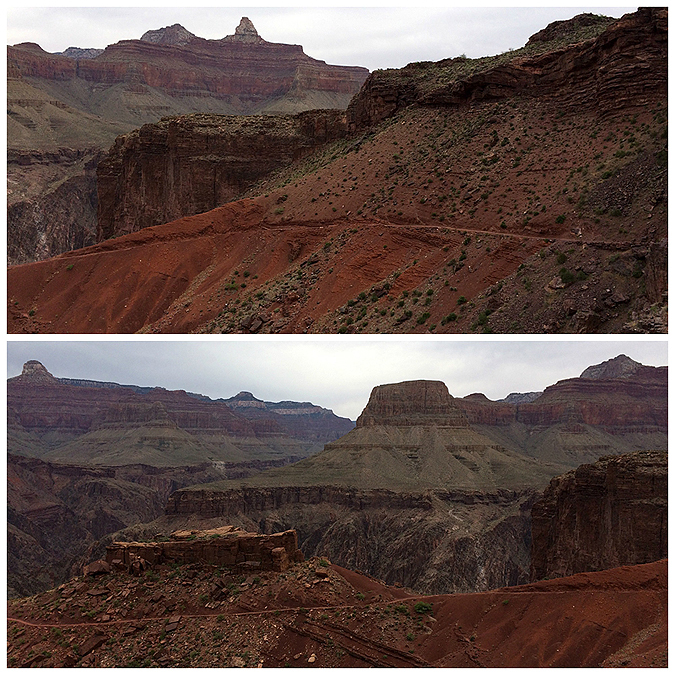 The trail is a pleasure to hike on; red clay, easy grades, phenomenal views, and mule poop, yes mule poop! 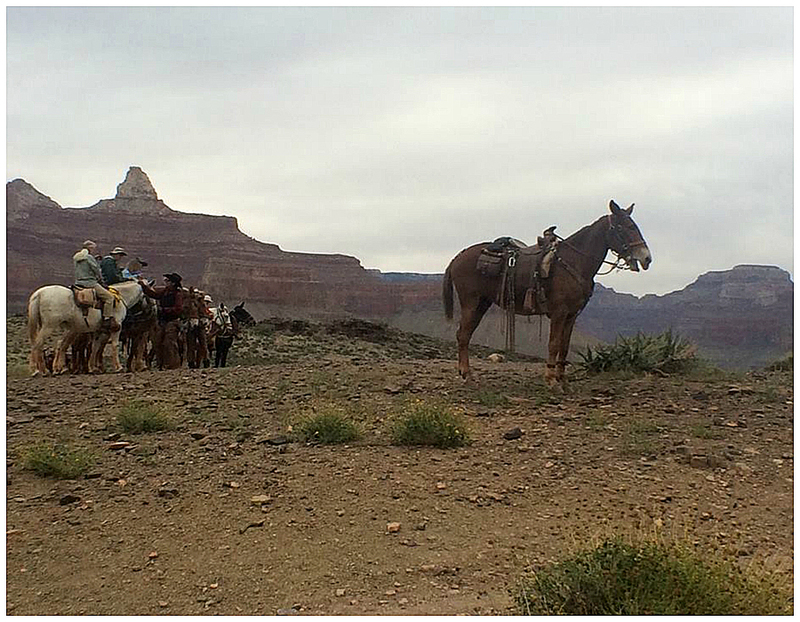 Every morning there are a few mule trains that go into and out of the canyon, some carrying supplies and others carrying tourists. One thing they do is all poop and pee in the same spot! 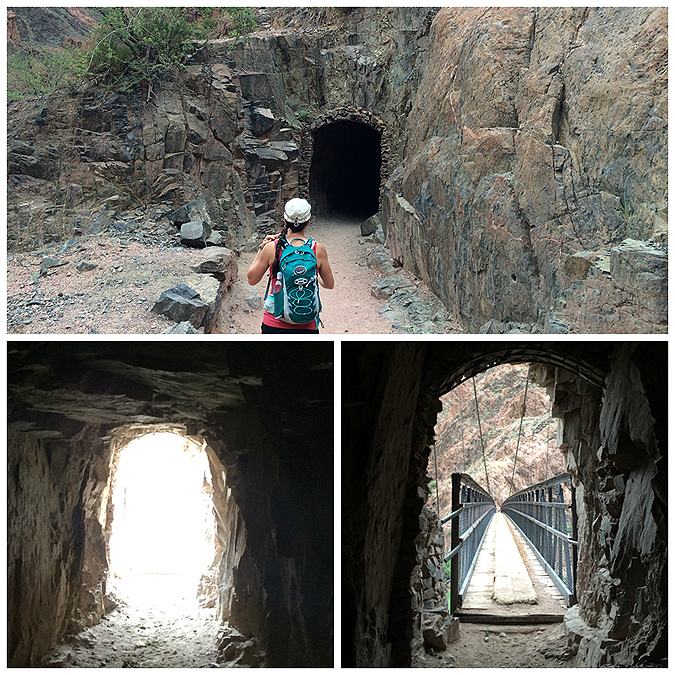 Every so often we'd come around a switchback and BAM - POOP and wet clay, it was pretty smelly but we were lucky, it's a thousand times worse when it's 100 degrees and the sun is beating down on you! 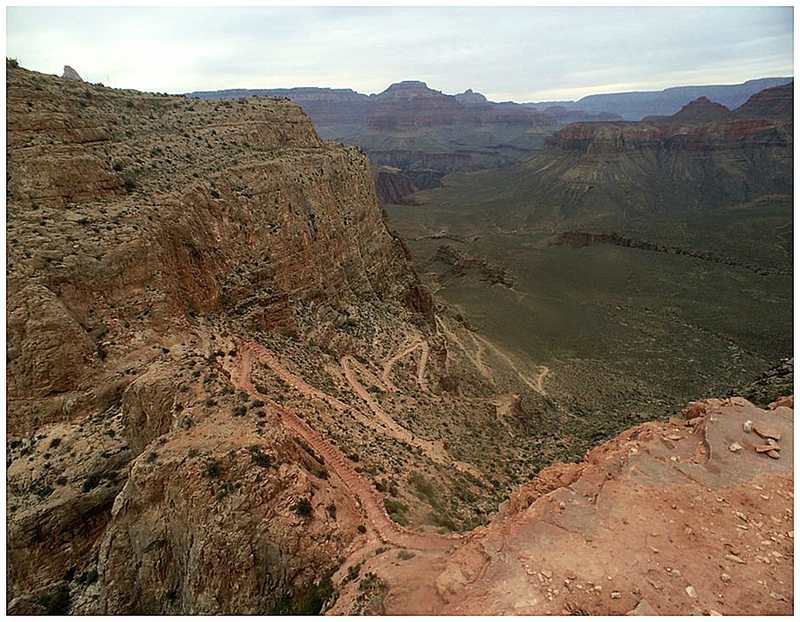 - Past O'Neill Butte is where the South Kaibab Trail descends a series of a dozen switchbacks through redwall limestone, it's a masterpiece of modern trailwork to look down at the corkscrew of swithcbacks that leads to the vast Tonto Platform about a thousand feet below. - After the switchbacks the trail curves around the Natural Arch Butte and then straightens out as it crosses the Tonto Platform at the Tipoff. 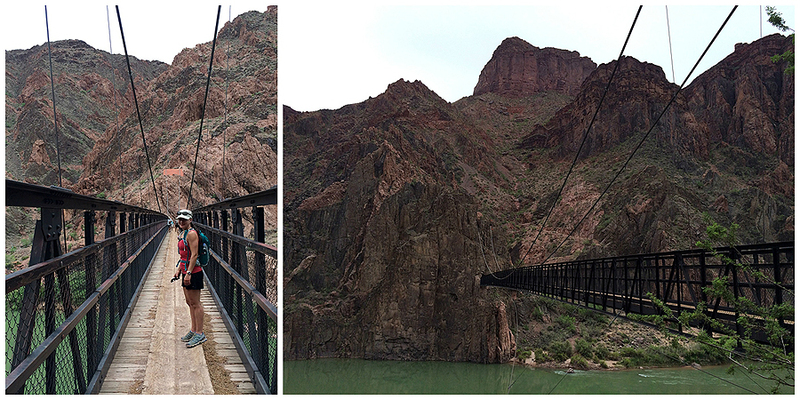 Here we took a nice little break and watched the mule train carrying tourists up the canyon. If you never seen a mule before, they look almost like horses, the difference is their ears are bigger, their faces aren't as narrow, they seem a little 'blockier', and last but not least, they're just goofier! 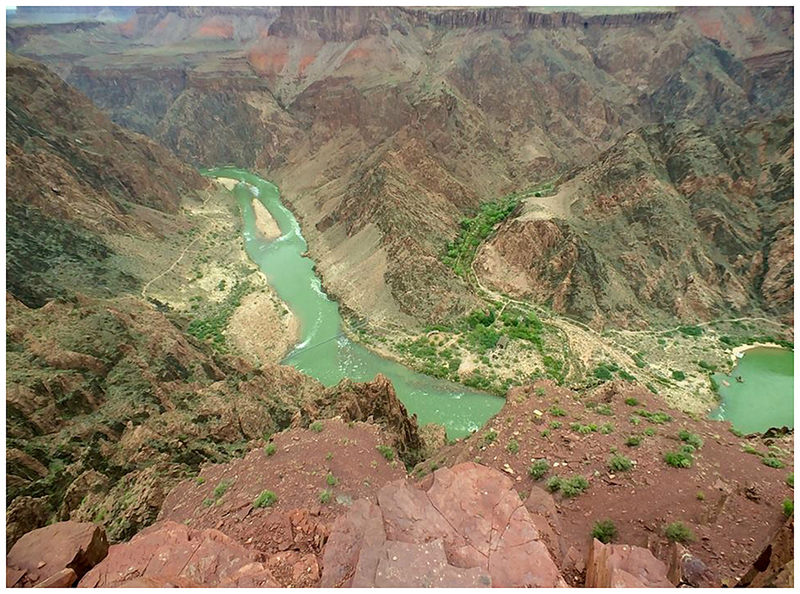 - From Tipoff to the the Colorado River is a descent of about 1,500 feet over dark red clay where views of the Colorado River and it's emerald green color become grander as the trail descends deep into the canyon. 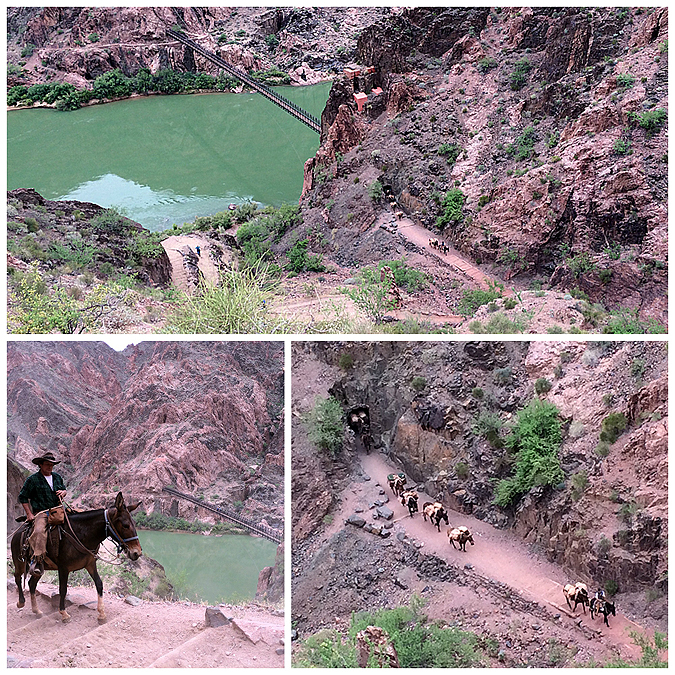 We passed another mule train near the bottom, this one was a supply train which runs food, trash, letters,etc., from Phantom Ranch up to the south rim. 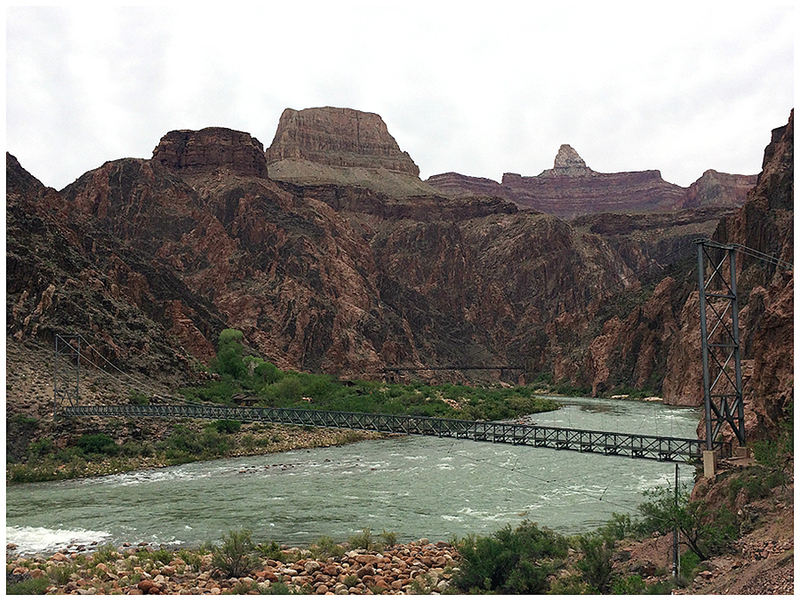 Soon we made it to the Colorado River where we walked across Black Bridge to the other side. 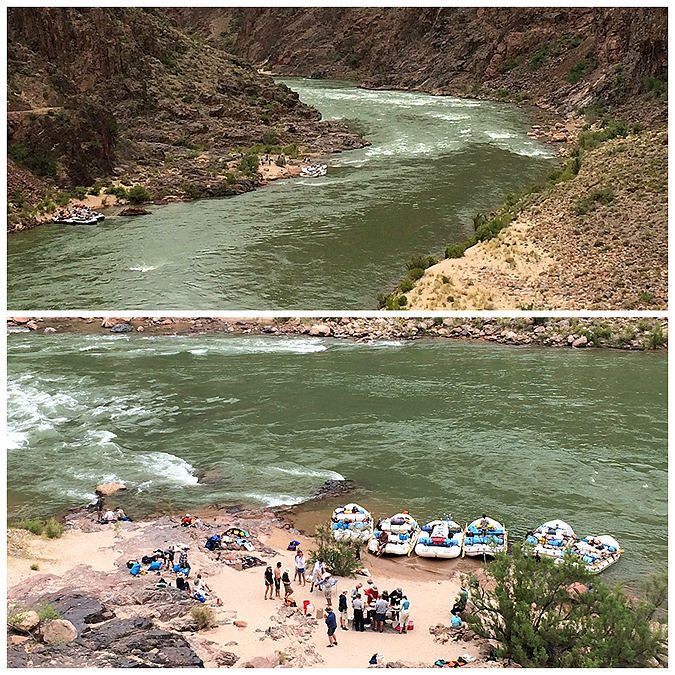 - After crossing the bridge we went down to Boat Beach where some river runners where packing up gear for their white water rafting trip down the Colorado River. 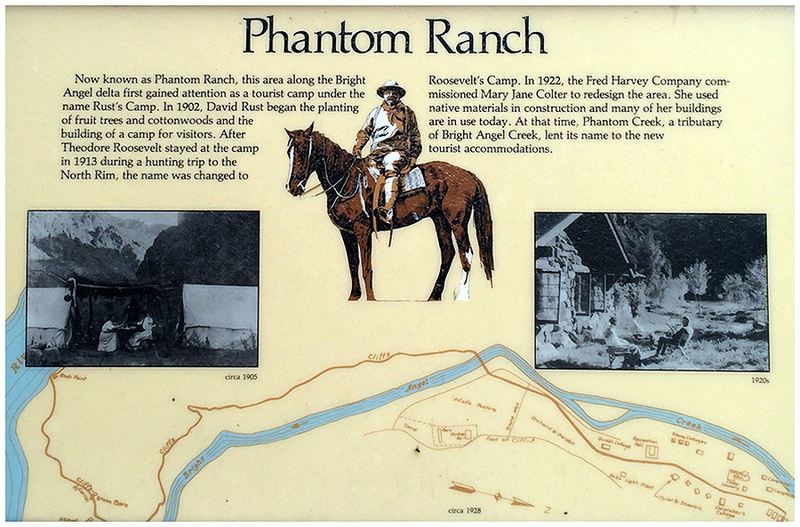 - From Boat Beach it's just about a half mile to Phantom Ranch. 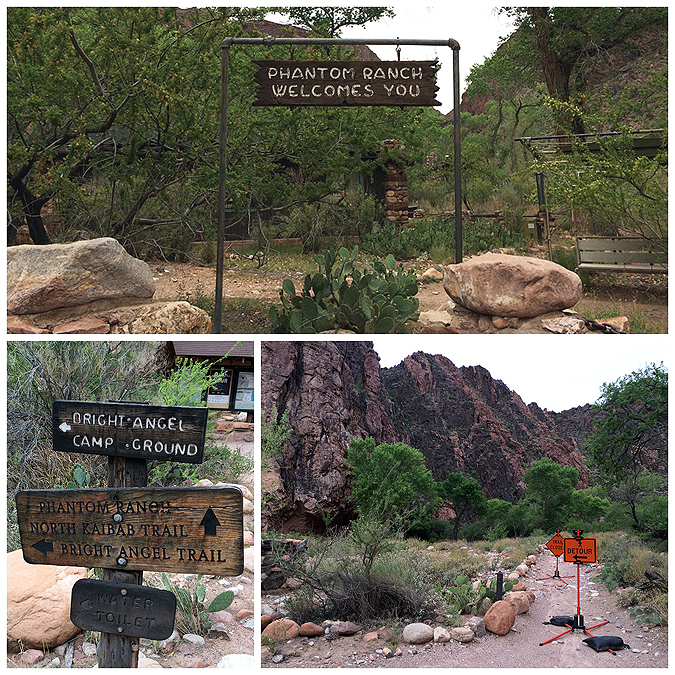 Phantom Ranch is a very popular destination for hikers, you have to book about a year in advance to secure one of the cabins with bunk beds. 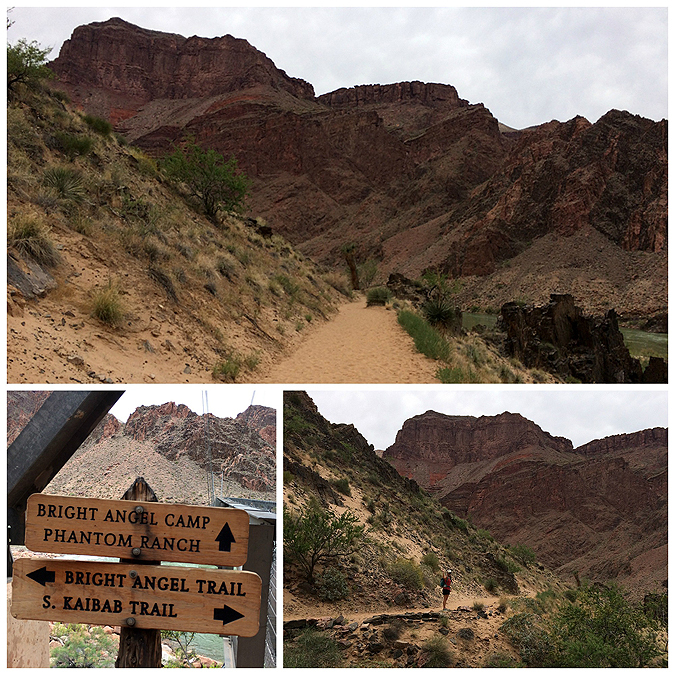 There is also Bright Angel Campground where you can set up your tent along Bright Angel Creek, this is a hot spot too for hikers so a reservation is needed well ahead of time. 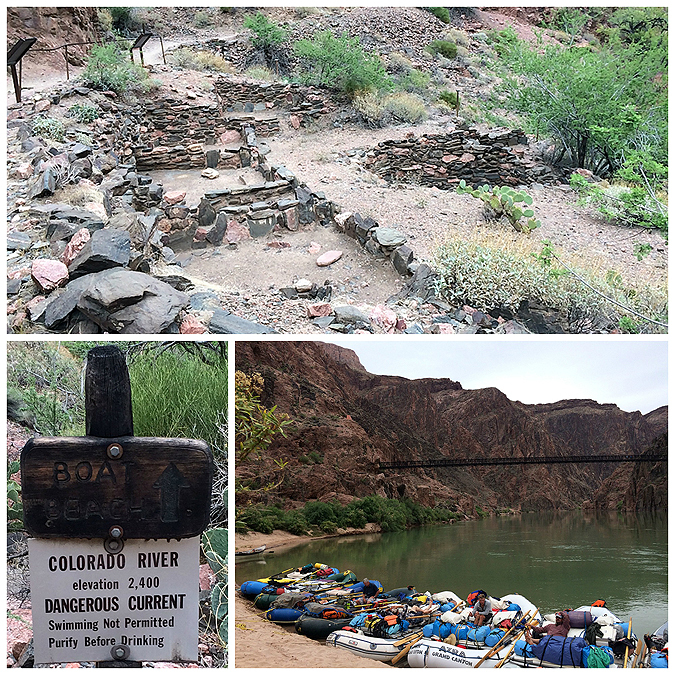 - After we rested we headed back to the river and crossed the Colorado a little further downstream over Silver Bridge where we hooked onto the Bright Angel Trail. 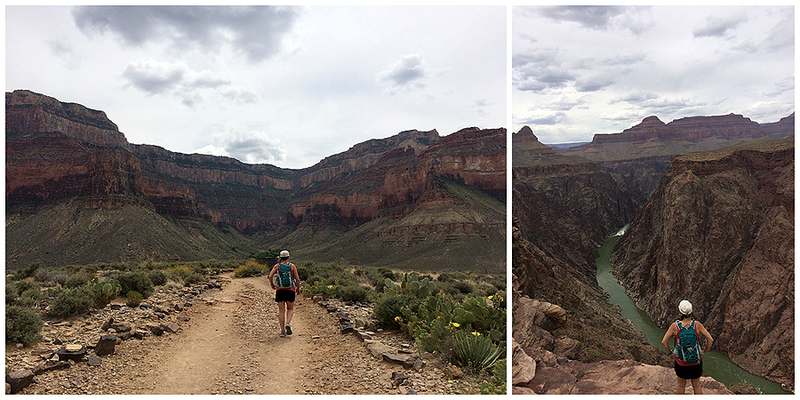 The Bright Angel Trail is the most heavily used canyon trail. 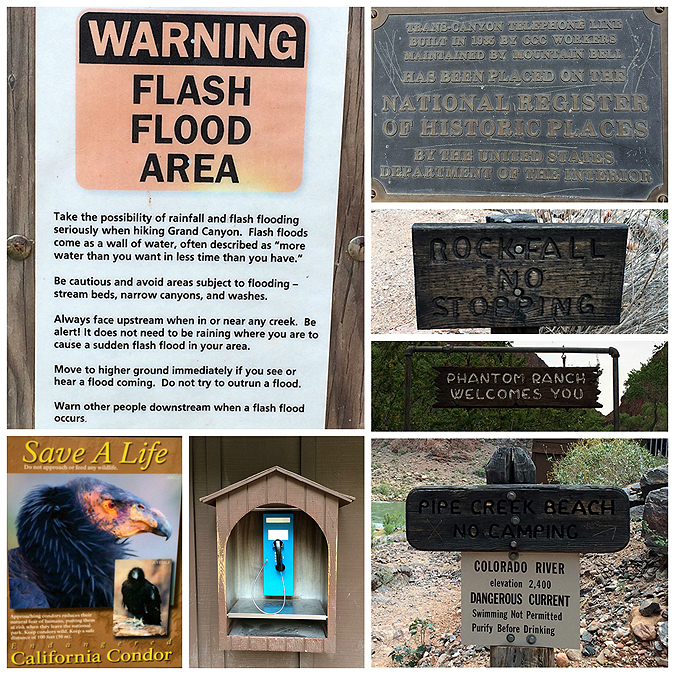 The good news about this is there is water every few miles with a rest house to get some shade, there is also Indian Garden where there is plenty of shade. 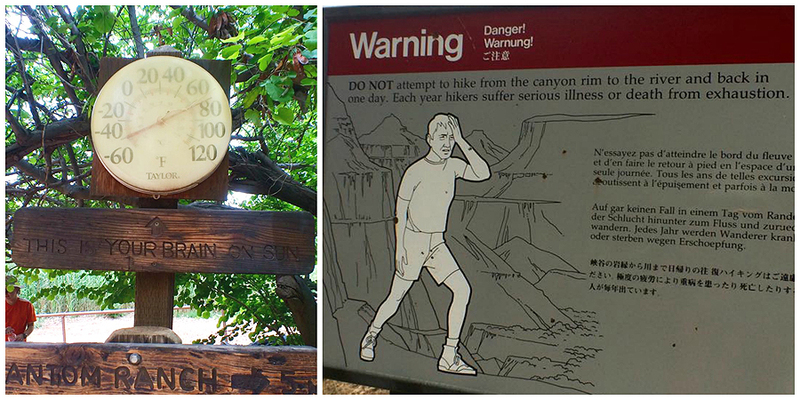 The bad news is you get a lot of unprepared hikers who hike down then realize they have to hike up and run into trouble. Also, the mule poop seems to smell worse on this trail! 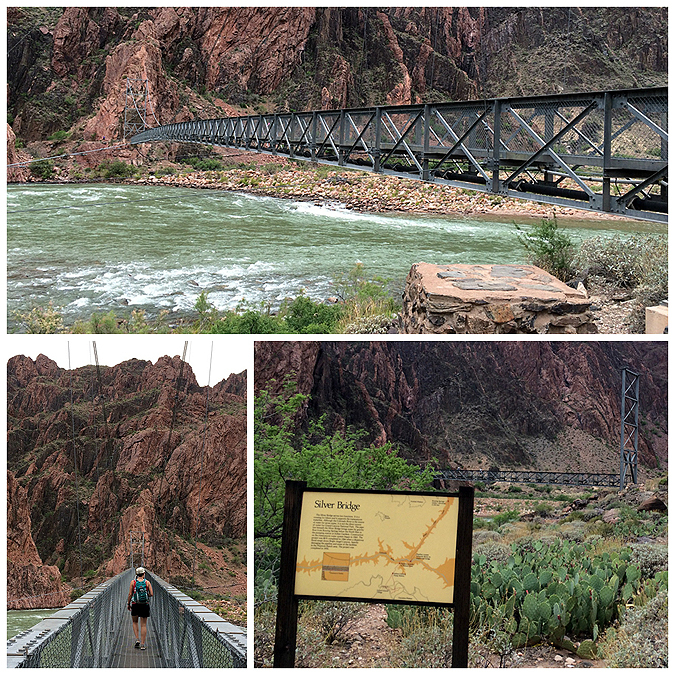 - The first mile and a half the trail gradually makes its way along the Colorado River, about fifty to one hundred feet above it over beach sand. 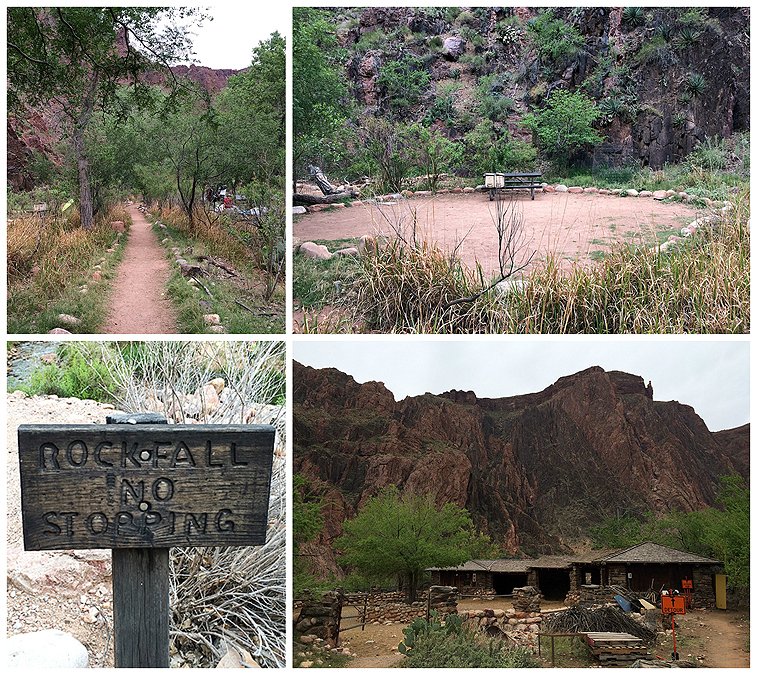 The Bright Angel Trail has all sorts of unique trail conditions; sand, clay, an oasis at Phantom Ranch, and rock along the upper canyon wall below the rim. 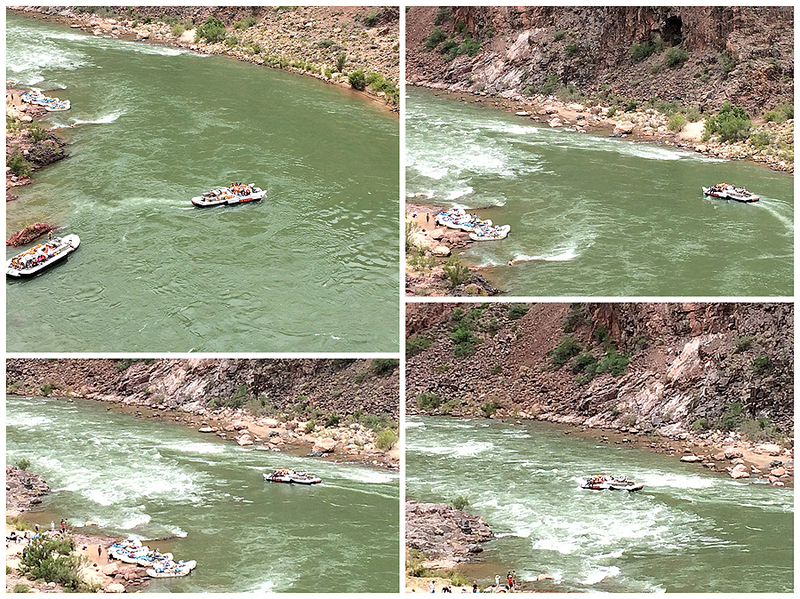 - As we headed by Pipe Creek there were a few rafts leaving the beach and heading into the rapids which looked pretty exciting. 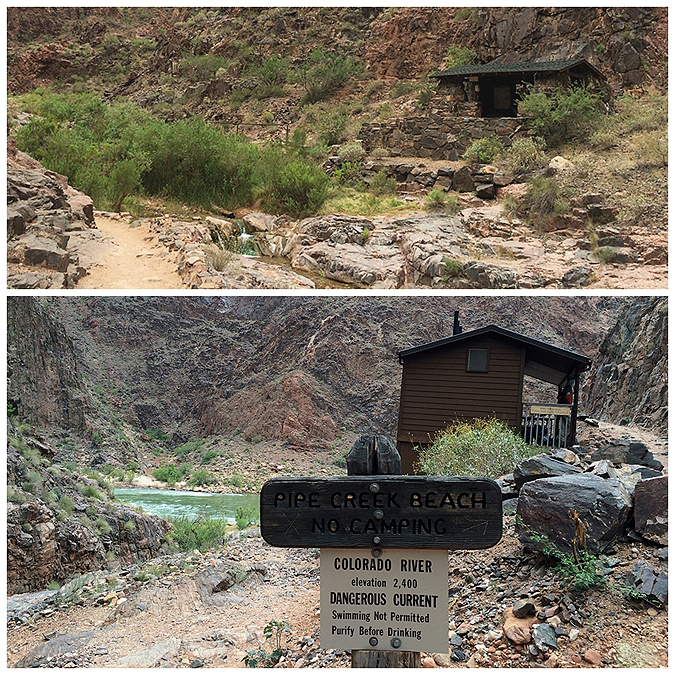 - The Bright Angel Trail takes a sharp left above Pipe Creek beach away from the Colorado River and heads back up the canyon. 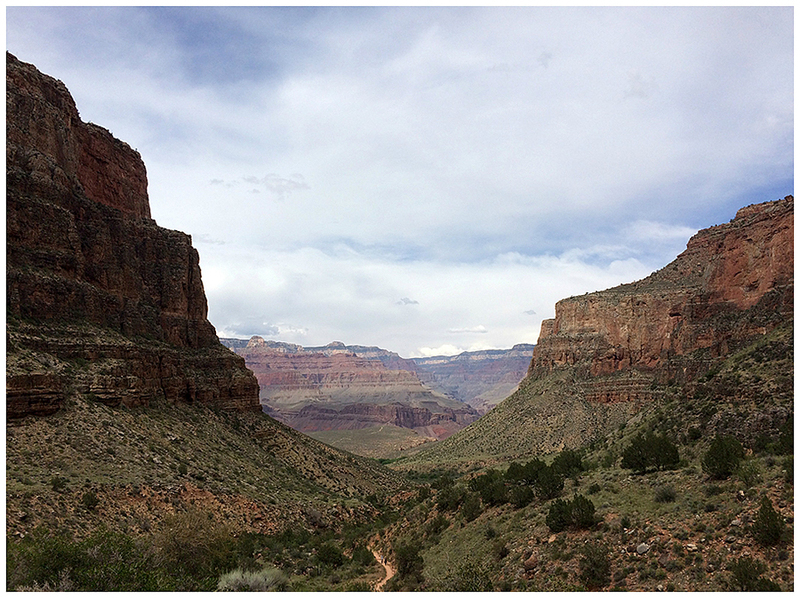 From here it's just over three miles to Indian Garden. 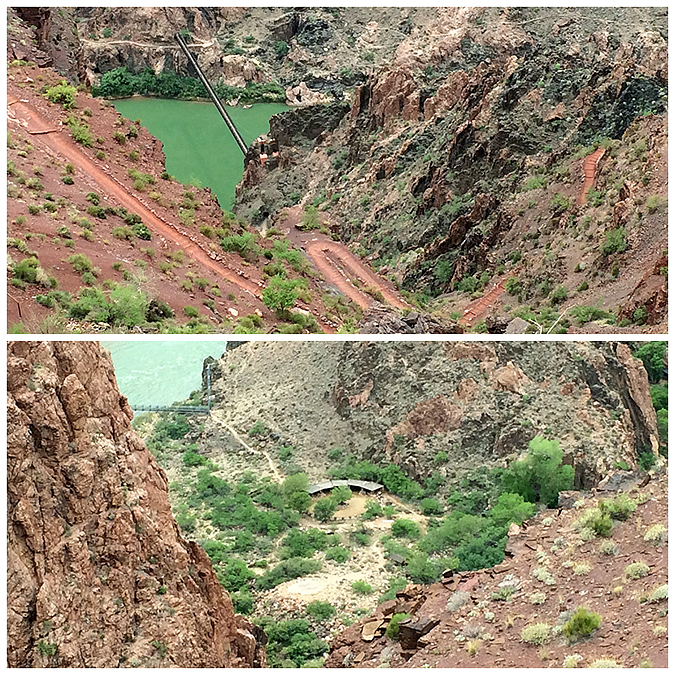 This is usually the toughest spot as the sun is beating down on you while you ascend a bone dry and dusty trail but today it was a simple hike up with the cool temperature and cloud cover. 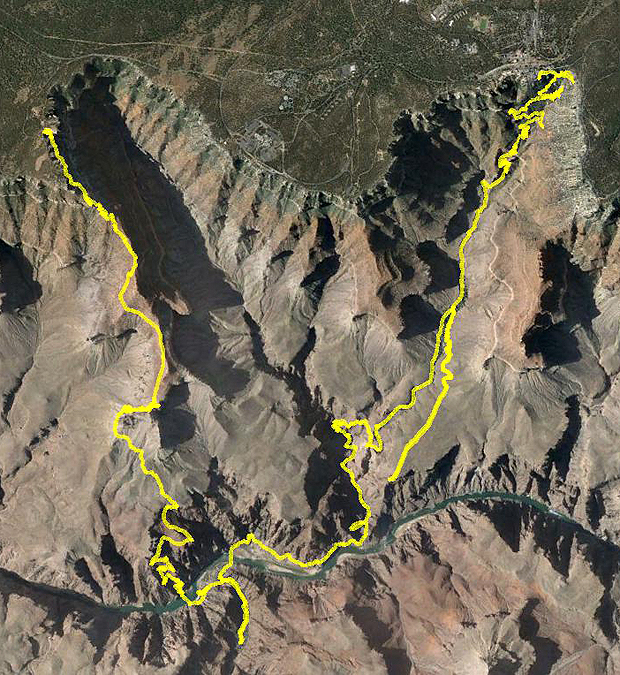 Whitney and I are both used to steep and rugged trails of the northeast, here most trails have moderate grades, lots of switchbacks, and incredible footing. 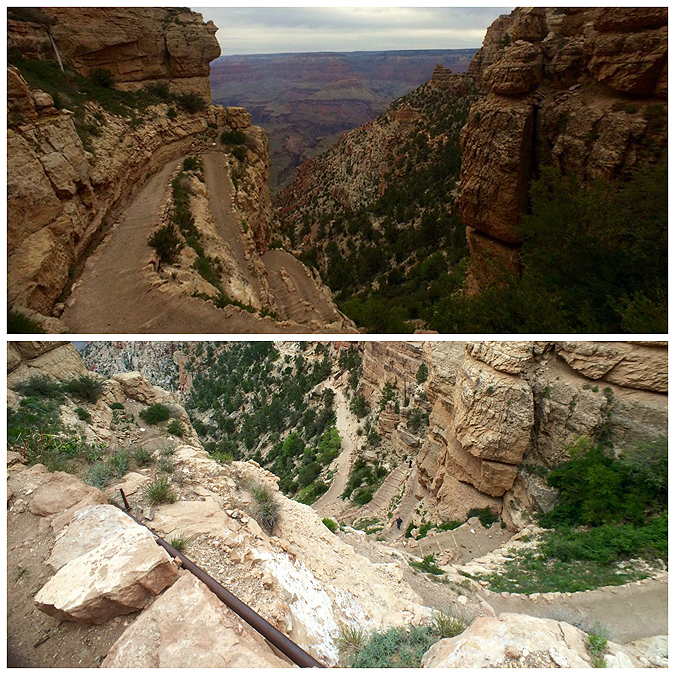 We motored up through the crux of the lower end of the Bright Angel Trail, a little spot called the Devil's Corkscrew through the Vishnu Schist. 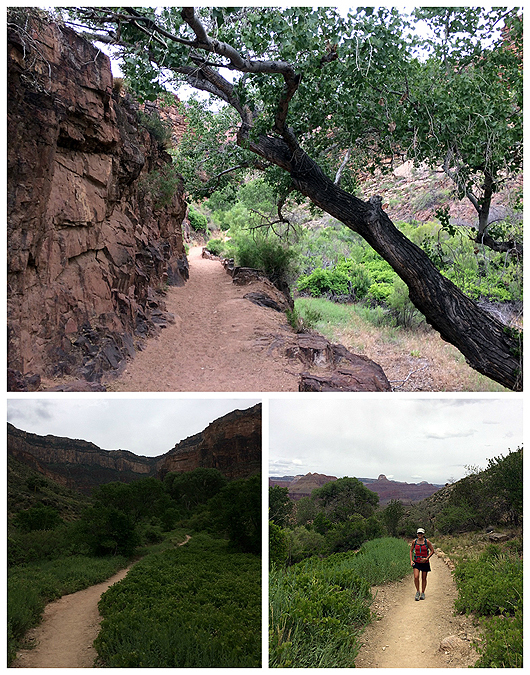 After this the trail levels out and parallels Indian Creek through the Tapeats Narrows on it's way to the mini oasis called Indian Garden. 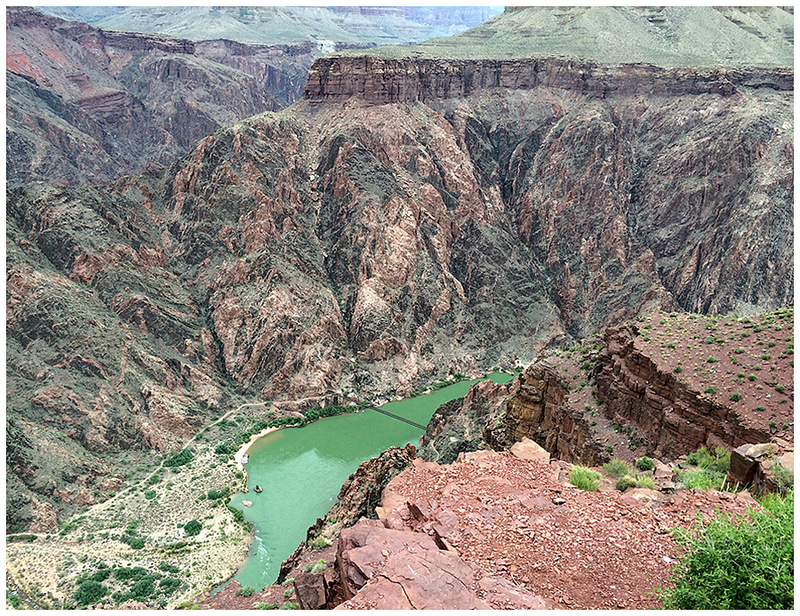 - From Phantom Ranch we took a nice little hike a mile and a half out to Plateau Point for one last big view down to the floor of the canyon and the Colorado River from 1,500 feet above. We now started running into the 'tourist' hikers, the guide book lists Plateau Point as the 'maximum day hike destination' so from here on out there would be hikers here and there but overall it wasn't too bad, we definitely were in the minority language wise as most people were speaking French, Chinese or Smackers! 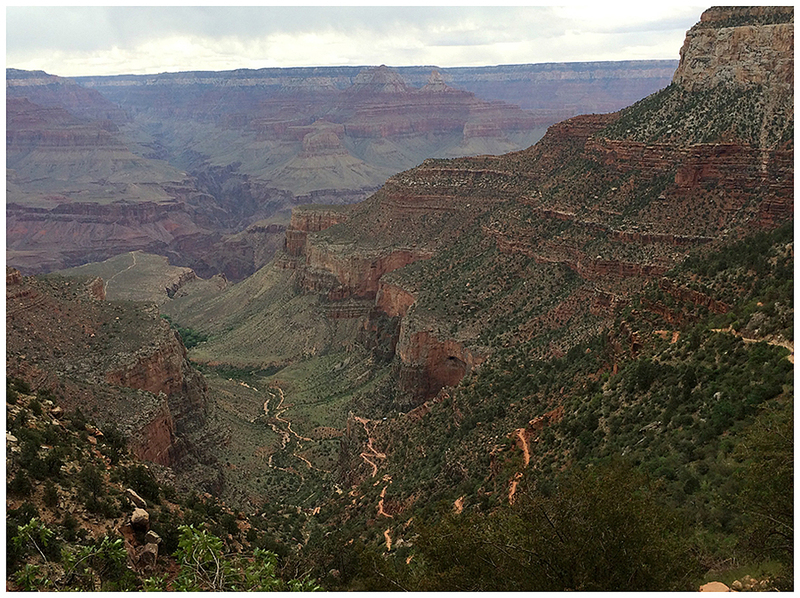 - Once back at Indian Garden we wad about 4.5 miles back up to the South Rim, once again with the unseasonably cool temperature and cloud cover we basically speed hiked back up to the rim taking pictures and taking in the views from the long switchbacks dubbed 'Jacobs Ladder' before making it back to the south rim and back over to the Jeep. 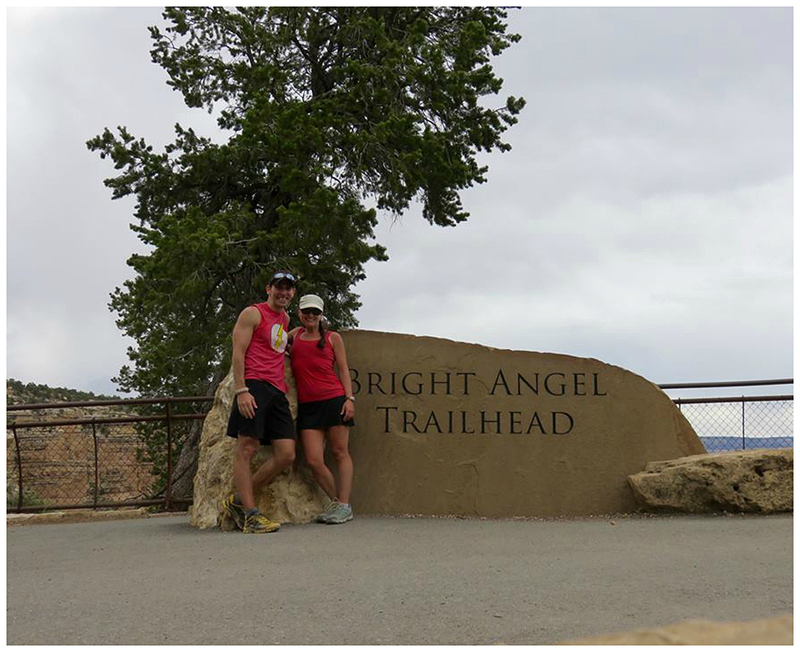 - It was probably the most fun I've had in the canyon since I was a teenager, the weather made it an easy hike and let us enjoy all sections of the trail while barely breaking a sweat all day! 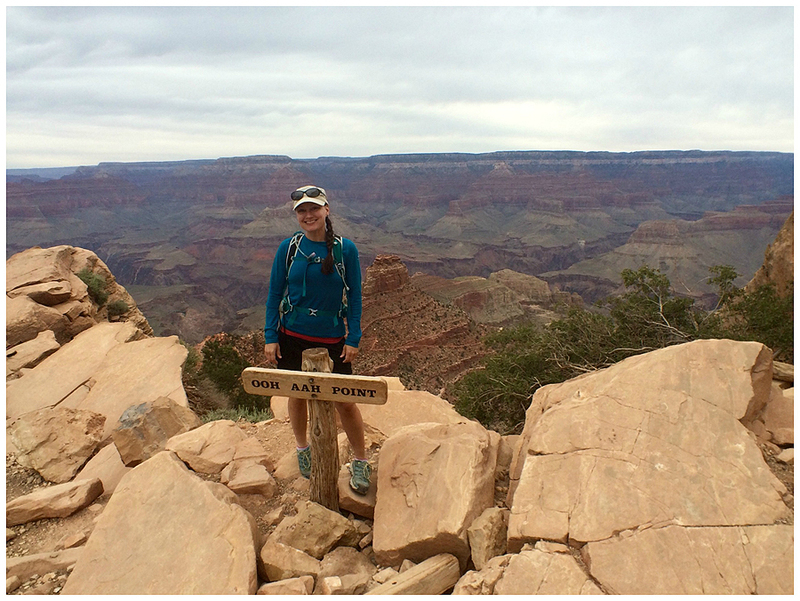 Whitney at Ohh Ahh Point! 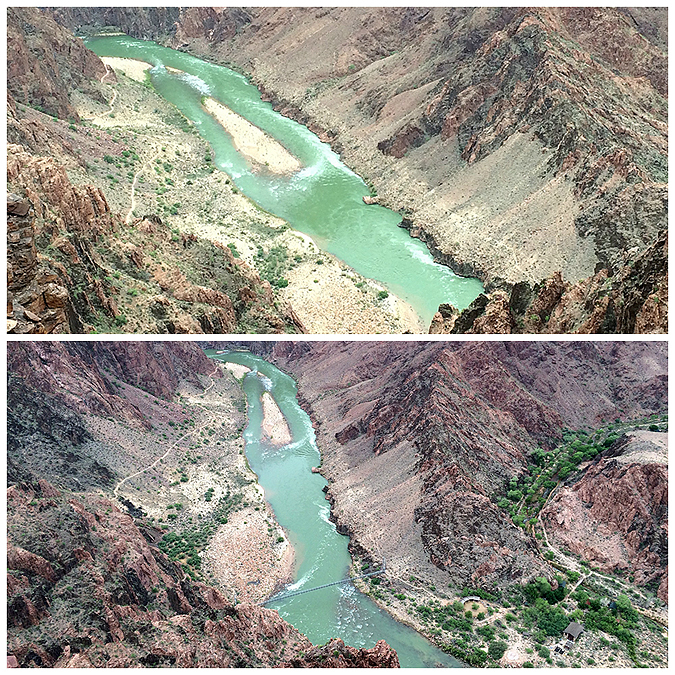 The Colorado River looms large a few thousand feet below us! Heading into Pipe Creek rapids! Entrance to Pipe Creek beach, no swimming! 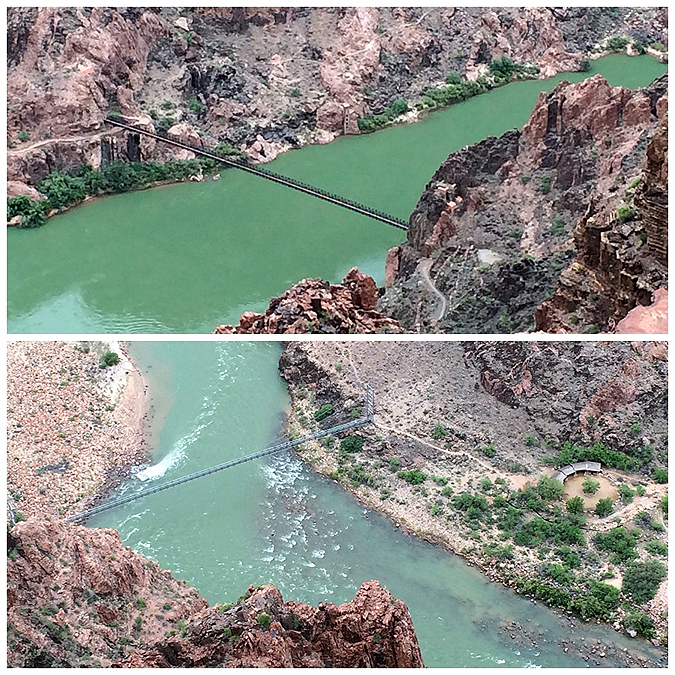 Between the Black Bridge and Pipe Creek is the spot where the most people have drowned over the years in the Grand Canyon! 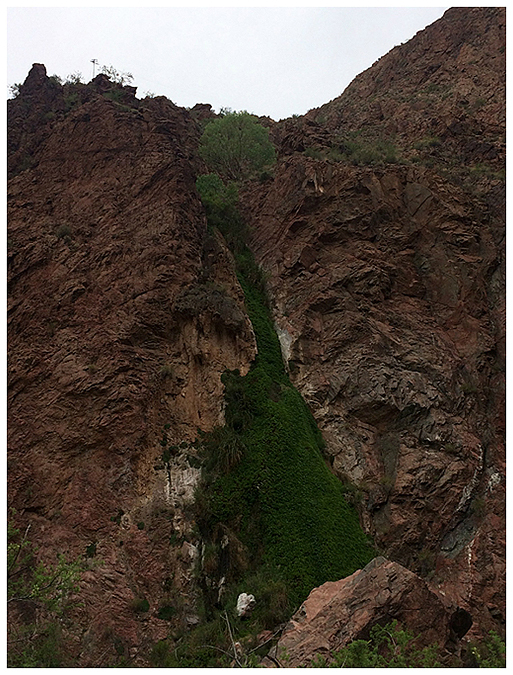 Checking out the cliffs above us. The jagged one on the bottom right is the one I bushwhacked to just two days before! 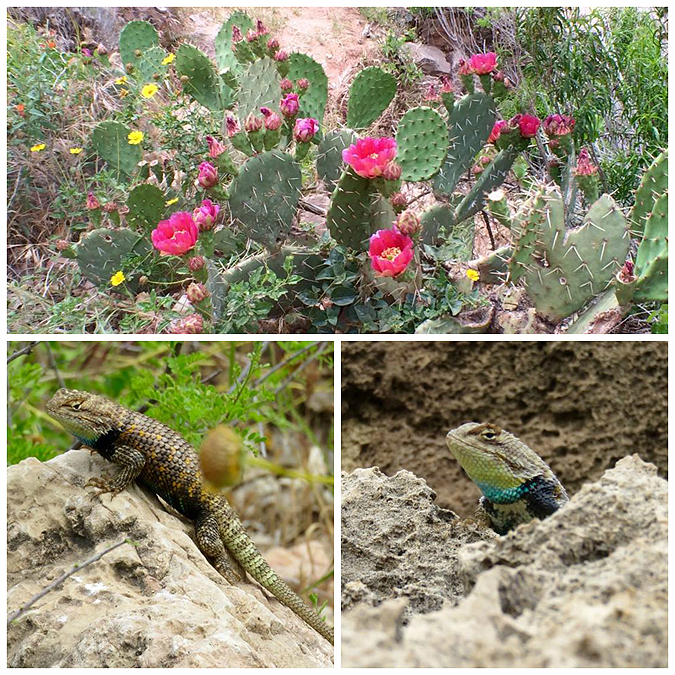 Cacti and Lizards! These lizards were in love! 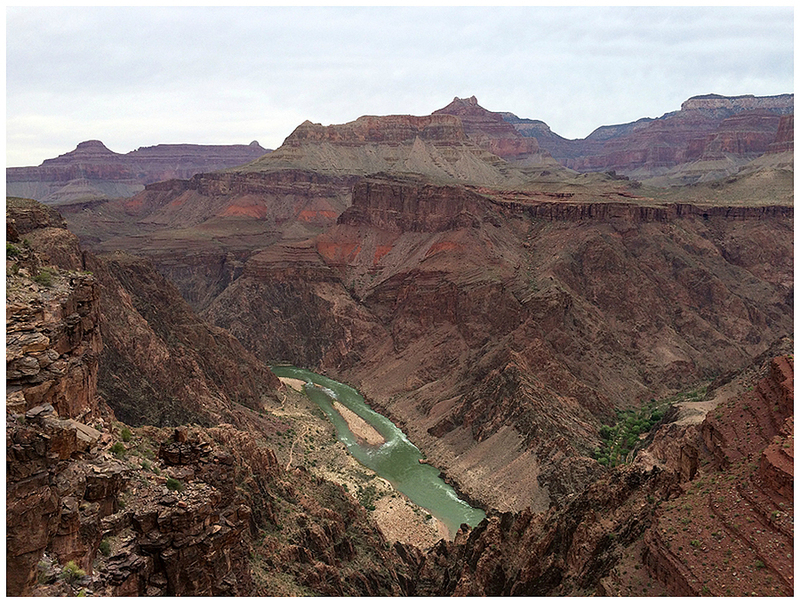 By canyon standards in late May, this day was on the chilly side. Perfect for a big hike! Stuff spotted along the way...the pay phone cracked me up! 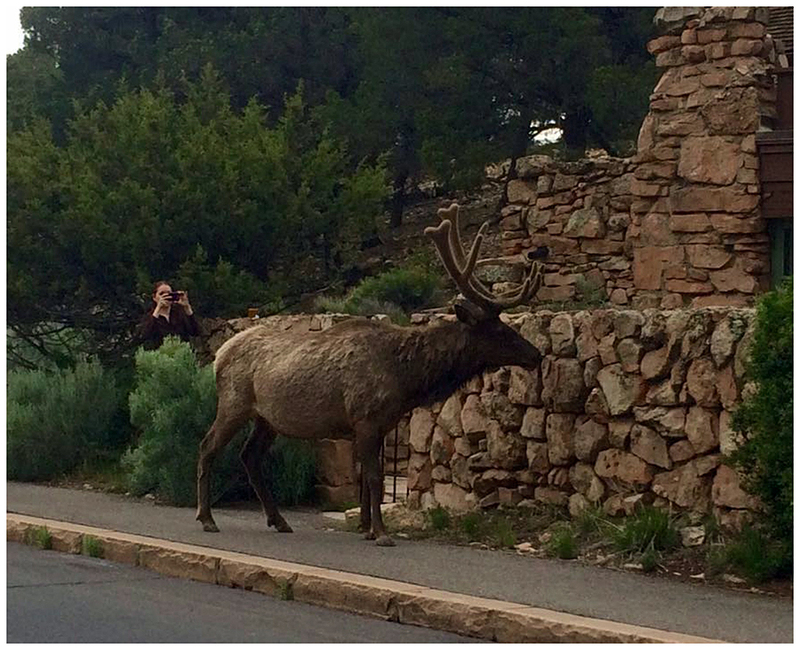 Elk, these furry bastards were everywhere!